What is your pet peeve? Mine is interruptions. I’m one of those people who get very focused when they are working on something. It doesn’t matter if it’s reading a book, quilting, cleaning, or doing a task at my REAL job (w.o.r.k.). Interruptions throw me off. The only thing worse than an interruption is someone who constantly interrupts a conversation. It’s bad enough when you’re with a group of people and the same person keeps interrupting, but it’s worse when you’re having a one-on-one discussion with someone and they keep cutting you off while you’re talking. Doesn’t that make you feel like you’re not important? I have decided to speak up and point it out to “the culprit” more often, because it’s really getting on my last nerve! If you’re surfing the Internet, here are some very pleasant interruptions that you probably won’t mind at all! 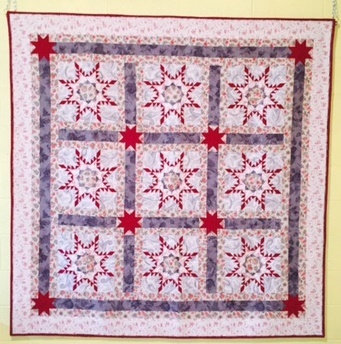 Ronda’s Creative Quilting – Take a look at the beautiful quilt that Penny finished and Ronda quilted. Stunning! Pine Ridge Quilter – Laura is posting a quilt each of the days of Christmas and has started already! Check out this beautiful antique quilt, and bookmark her blog so you can follow along. What a super great idea! Treadle Quilts – A spectacular miniature quilt called “Underground Railroad.” Wow! Real Men Quilt – I could be Adam’s biggest fan. I love his quilting. It is so detailed! Check out his new quilt in progress! Lastly, I want to share this great picture with you. Dean and I visited the Detroit Institute of Arts on Sunday and saw an exhibit of the great masters. This is one of my favorites that we had the pleasure to see up close. 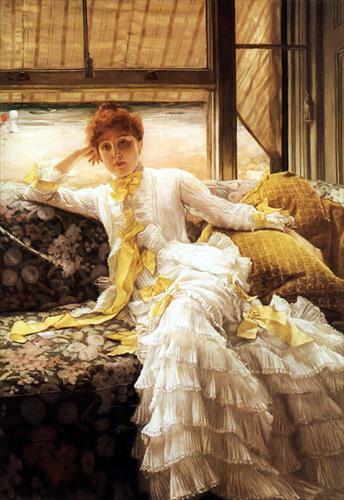 It is called “July: Specimen of a Portrait” c. 1878 by Jacques-Joseph Tissot, a French painter who lived from 1836-1902. This picture of it does not do it justice. It’s a fairly large oil painting on fabric, and the detail on it is exquisite. It looks like a photograph! The way he used his paints to show the sunlight is simply amazing. Her dress just shines! If you ever get a chance to see his work – or any of the masters – in person, please take the time to go. You will never regret it! It makes me wonder what people 200 years from now will look at that we have left behind! hi there, thanks for sharing the links, it is always nice to be able to surf into some good design inspiration. The quilting in Real Men Quilt’s header is so inspirational.Also, thanks for sharing your story about how you got into quilting (in your previous post), it is inspiring to me to keep reminding myself that good things take time, and sometimes great things can take even more time. I am still learning patience.Keep quilting! !